Everything tastes better on the grill. And few times are happier than backyard barbecues with friends and family. So the new Downtown Crossing restaurant Back Deck would seem to have hit upon a winning formula: Cook most things over hardwood charcoal in a setting designed to evoke a summertime cookout. But even casual cookouts can go awry. It is unfortunate that Back Deck has no actual outdoor space. There are sliding 16-foot windows, although even they are closed each time I visit. Yet it’s New England, and the idea of a year-round cookout has appeal, particularly right in the middle of the city. Back Deck’s interior is at least deck-esque, with planters, lights that resemble umbrellas and birds’ nests, and a mural depicting a barbecue that actually takes place outside. The handle of the restaurant’s door looks like a spatula. There is a sweet little bar area at the front, from which one can watch the action in the open kitchen, where there are three impressive grills. Also unfortunate is that enough new barbecue restaurants have opened of late that many diners arrive expecting pulled pork and ribs. That is not at all what they get. This is a barbecue in the Northern sense, with hamburgers and beer-can birds (but no hot dogs). It is also a barbecue thrown by a chef, Paul Sussman (Daddy-O’s), so the basics are just the beginning. That bird roasted on a beer can? It’s a Cornish game hen. And by the time it’s served, the can has been recycled, the hen dispatched into civilized pieces and plated with basmati rice and sauteed spinach. Although the skin is a bit flabby, this is a nice dish, the meat moist and tender. But it lacks the no-frills, tailgate spirit of the original. From there, the menu branches out into dishes that sound either spicy and fun (hot wings, cowboy steak with chimichurri sauce, scallop tacos) or refined (salmon Cobb salads, porterhouse pork chops with cranberry-pecan chutney and bour-bon mashed sweet potatoes, grilled vegetables a la Provence). This would be delightful if so many of them weren’t entirely lackluster. What happened to “everything tastes better on the grill”? “Smoky creamy eggplant spread” seduces everyone with the promise of baba ganoush, but it turns out that “creamy” is literal. The eggplant is adulterated with creamy cheese, and it tastes nothing like the spread one had hoped for, or, in fact, eggplant. The salmon in our apparently dressing-free Cobb salad is dry, overcooked, and fishy-smelling. The grilled vegetables a la Provence turn out to be That Dish, the one all vegetarians know too well — the one that feels born of desperation. It is a plate of wan vegetables and dry grilled chickpea panisse, polenta-esque cakes prepared with garbanzo flour. “At least the grilled onions are good!,” pipes up the table’s good-sport vegetarian. And the spicy red pepper rouille that accompanies the dish is excellent, too, with the flavor of a fiery gazpacho. 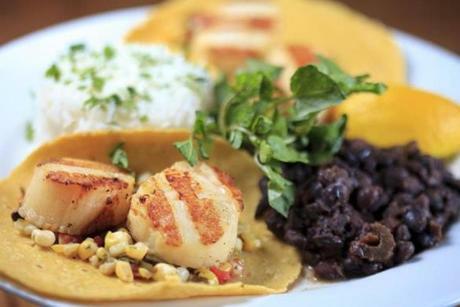 Grilled sea scallop tacos with grilled corn salsa, black beans, and rice. Grilled squid is chewy and bland; a soup made with grilled and fresh corn and poblanos tastes salt-free. A mixed grill plate offers a beef kebab, lamb skewer, duck sausage, and portobello mushroom, all dry, overcooked, and lacking flavor. On the bright side: The new potatoes that come with the dish are quite good. The skinniest porterhouse pork chop of all time is well-done, and the mashed sweet potatoes have an unpleasant stringy texture — never mind that the dish is fall on a plate, during the summer, at an indoor cookout. A muffuletta burger, however, is pink inside and perfectly juicy, topped with provolone cheese and “Creole olive salad.” It tastes more like tapenade than the stuff you’d get on the famous New Orleans sandwich, but its salty tang complements the burger. The garlic mayo on the side is not at all garlicky, and just as well left off. Back Deck’s fries are half-moons of potato, soggy and sad, looking like they’ve been sitting for a while. You can get potato salad instead, or coleslaw perked up by the addition of green apple. The two best dishes on the menu are the two most expensive. The first is a bone-in rib eye, wide and thin; real steak lovers might be happier with a smaller, thicker steak. It tastes nothing like the coffee and chili the menu says it’s rubbed in, but it’s cooked just right and served with vibrant chimichurri that pairs well with the beef. Grilled corn and watercress round out the plate. Back Deck s’mores use espresso-flavored marshmallows. And tacos feature great grilled scallops, with clear grill marks yet just cooked through. Grilled corn salsa adds spice, rice and beans add heft. It’s a good thing, because there are only four scallops per serving. Nothing at Back Deck is plated with particular bounty, and prices feel high for what you get. 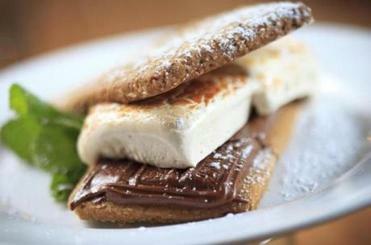 For dessert, the clear choice is the Back Deck s’more. The house-made graham crackers are thick and dry, but the combination of melting chocolate and toasted espresso-flavored marshmallow wins the day. Servers are spunky and competent. One keeps commenting “Isn’t it good!” with such enthusiasm we don’t have the heart to rain on her parade. Another seems to realize that our entrees have arrived essentially on top of our appetizers but isn’t quite sure what to do about it. Cocktails are often well made, from an elderflower margarita to the generously gin-filled and very green Berkshire Summer, which also contains lemonade and cucumber juice. The nonalcoholic Back Deck lemonade, available fizzy or still, is excellent, striking the right balance between tart and sweet. Beer offerings are more interesting than wine, ranging from Pretty Things Jack D’Or to Otter Creek Stovepipe Porter. Many of Back Deck’s dishes may lack luster, but there’s nothing wrong with sharing burgers and $12 pitchers of ’Gansett on a hot night, in the air conditioning, away from the whine of mosquitoes. And on each visit, Back Deck is busy. Reservations are required for this barbecue. In sometimes troubled Downtown Crossing, it’s a heartening sight. New restaurants are opening here, and people are eating at them. Even when your pork chop is overcooked, Back Deck offers something to feel festive about.